It's a big move when it's time for a loved one to make the transition to senior living, and there are a lot of important decisions to make such as when to move and how much to spend. As you begin the process, you'll develop a host of questions you didn’t even know you had. This is why it’s so important to make the most of all available information —so you can rest assured that you’ve made the best decision for yourself and your loved one. Personal experiences and anecdotes can go a long way when you’re planning for a successful transition to senior living. This is especially the case when they are from friends and family whom you know and trust. If a loved one doesn’t feel open to the idea of an assisted living environment, positive reinforcement from familiar voices can mean a world of difference and calm any anxieties. Ask around and see if any of your friends have had family members in senior living communities. It’s also crucial to listen to your loved ones so that you have a clear understanding of their wants and needs. Their happiness and comfort should always be the priority. After all, that’s what senior living is all about: making the most of their senior years with a high quality of life. The internet can be an incredibly valuable resource when looking for a senior living community. Just be sure to pick your sources carefully, as the volume of information can be overwhelming and some can be misleading. Some great online resources include the websites of any senior living communities that you’re interested in, including blogs like this one. 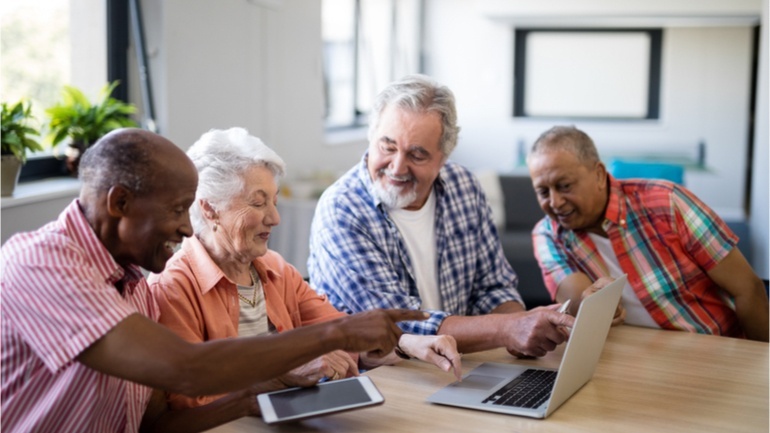 Social media can also be a valuable online resource, as a senior living community with an active online presence means they’re in touch with technology and better equipped to address the needs of an increasingly tech-savvy older generation. After all, around 45% of seniors currently use social media, and that number will only increase. Another great way to ensure you have the best possible information is to turn to people who can draw on years of professional experience to provide valuable, objective guidance. These can include physicians, pharmacists, counselors, pastors, and senior living staff. In addition to providing guidance in the form of literature and brochures, it can be especially helpful to visit prospective senior living communities with your loved ones. This will allow them to see and get a feel for the setting and atmosphere. They can also get a better idea of the type of lifestyle that would be available to them. The advisors at Weatherly Inn are here to be a resource for you. We want to help you find the perfect balance between independence and care. Downloading our free guide, "Senior living options that make the golden years sparkle" is a great starting point. Of course, we are always just a phone call away.